Each Tracker model is fitted with two high grade Gen 1 image intensifier tubes that are colour and gain matched for optimum performance. The wide exit pupil diameter from each ocular negates the need for interpupillary adjustment, which in turn gives a less complicated, but stronger body-shell design. A contoured one-piece wrap-around eye-cup prevents external light intrusion and the permanently attached Eclipse™ objective lens caps can be rotated and opened right back along the body to prevent loss or obstruction. Both models have a built-in IR illuminator for use in low-light and total darkness, whilst benefiting from a tactile green/black sure-grip ABS plastic body-shell with partial rubber armouring for added protection and hold. 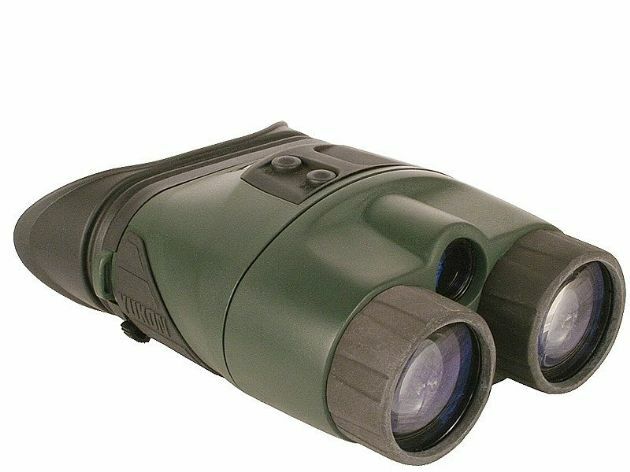 The Tracker RX 3.5x40 is the most versatile model in the Yukon Tracker range, being essentially a Tracker LT 2x24 packed with a 1.7x Lens Converter, offering either 2.0x magnification with a 25° field of view or 3.5x magnification with a 15° field of view. Powered from a single 3v Lithium CR123A battery (not included) they feature twin operational status LED’s that illuminate green and red depending on the active features and both models come with a detachable neck strap and stylish soft carry case.